Silver bars come in many different weights, sizes, and brands. Although most types of bars containing the same amount of silver will be worth the same amount of money, it is important to understand the differences between various silver bar types. This article will explain the differences between silver bar weights, purity, sizes, and brands/mints. All silver bars are made from the same material – typically .999 or .9999 silver – regardless of their weight. However, the size of bar you choose has a significant impact on your pricing, resale ability, and ease of storage. Many new investors wonder which size of silver bar they should purchase. 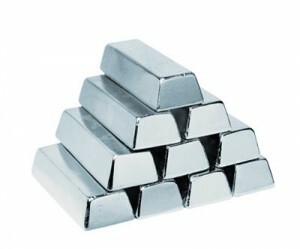 There are dozens of different silver bar sizes available from different mints. The most popular sizes are 1, 5, 10, and 100 ounce bars. There are also other options, such as the 1 kilogram, ½ ounce, 2 ounce, and 50 ounce. However, you’ll often pay a premium for these, as they are not produced by many mints. First, it is important to note that when talking about silver, weights are noted in troy ounces. Troy ounces are about 10% heavier than the ounce used to measure other items (a unit of measurement officially known as the avoirdupois ounce). Spot prices for silver are also quoted in troy ounces. One-ounce silver bars are a relatively affordable investment. This makes them more accessible for new investors. Smaller-sized silver bars represent an affordable way to get started in precious metal investment. Many investors purchase the largest silver bar size they can afford, since they are usually sold at the lowest per-ounce price. In general, the larger the bar, the lower the premium over spot, while smaller bars carry the highest per-ounce premiums. This is because the mint incurs the highest per-ounce fabrication costs with smaller bars. When investing in silver bars, one concern is how easy it will be to turn your investment into cash. Physical silver tends to be a very liquid investment. This is especially true when buying common sizes of silver bars, such as 1, 10, or 100-ounce bars, from well-known mints. On the other hand, some investors prefer to purchase smaller silver bars because they are easily divisible. If you purchase one 100 ounce silver bar, you can only sell the full 100 oz bar. On the other hand, if your money is invested in 100 one-ounce bars, you can sell any number of these at a time, while still keeping some of your investment stored in silver. This is an important consideration for investors who are buying silver bars as a hedge against the possibility of an economic collapse. Often, such investors buy silver intending to use it to trade for daily necessities if the current currency is rendered worthless. For these investors, it makes more sense to hold their silver in small, easily-traded coins or bars, rather than larger-sized silver bars which are not as practical for day-to-day bartering. Finally, there are storage considerations. Most sizes of silver bars are designed to stack easily. Still, if you have a large investment, having dozens of one-ounce silver bars may be more difficult to store than a single 100-ounce bar. A few larger bars can be stacked and stored much more efficiently than many smaller bars, even though they add to the same number of ounces. guish between the two purities while pricing their items. Although dimensions will vary slightly depending on the brand of bar, the numbers listed above are going to be very close for normal, rectangular-shaped bars. The process of transforming silver into a coin, round, or bar is known as “minting.” Around the world, there are dozens of mints producing silver products. Some of these are government-run, producing coinage for the country in which they are located. Others are privately operated. Investors purchasing physical silver can select from many different silver mints, each offering their own designs for silver bars. These mints vary dramatically in terms of products offered and prices charged. There are dozens of mints around the world making silver bars. Examples of major silver bar mints include Johnson Matthey, Engelhard, the Royal Canadian Mint, SilverTowne, Sunshine Minting, NTR Metals, and the Golden State Mint. The reputation of the mint is important, as it affects the bar’s liquidity and price; some mints are better-known than others, and their products often command a higher price. Each silver mint chooses the size(s) of silver bar they will mint. Some specialize in smaller bars, while others focus almost exclusively on larger-scale silver bars. For example, Johnson Matthey focuses almost exclusively on 100 oz silver bars, while Sunshine Minting only regularly produces 1- and 10-ounce silver bars. Each marks the silver bars with their hallmark, along with the bar’s weight and silver purity. One reason to choose one mint over another is the silver bar design. Some mints, such as SilverTowne, are known for distinctive designs, specializing in collectible silver art bars. Meanwhile, others, like Engelhard, are relatively plain and intended solely for silver investment. Some investors prefer a more eyecatching design, while others are focused on seeking out the lowest per-ounce silver price. Some silver mints specialize in producing only investment-grade silver bars. For example, SilverTowne produces silver bars exclusively. Others, such as NTR Metals, offer gold or other precious metal bullion in addition to silver. While many mints produce only silver bars, others also produce silver rounds, which are round (like a coin) but carry no legal tender value. A few, such as the Royal Canadian Mint, produce coinage for the country in which they are located, as well as non-coin silver bullion for investors. Another major difference between silver bar mints is the premium charged. The premium is the amount added on top of the spot price of silver. This accounts for the cost of producing the bar. Larger mints tend to have more efficient production methods, leading to lower per-ounce premiums. On the other hand, some silver bars are so hard to come by – such as those by Engelhard, which has not produced silver bars in more than a decade – that investors are willing to pay an added premium for them. These premiums also vary between new and second hand bars. Finally, there is one last reason to select one silver bar mint over another. If you plan to invest in silver through a silver IRA, consider whether the mint is approved by Comex, or the Commodity Exchange, Inc. Silver bars must be made by a COMEX approved mint in order to be eligible for silver IRAs. This ensures that they contain only the highest quality silver, at least .999 (‘three-nines’) pure.